The Palace of Westminster, home to the Houses of Parliament of United Kingdom. YAY! The Palace of Westminster! 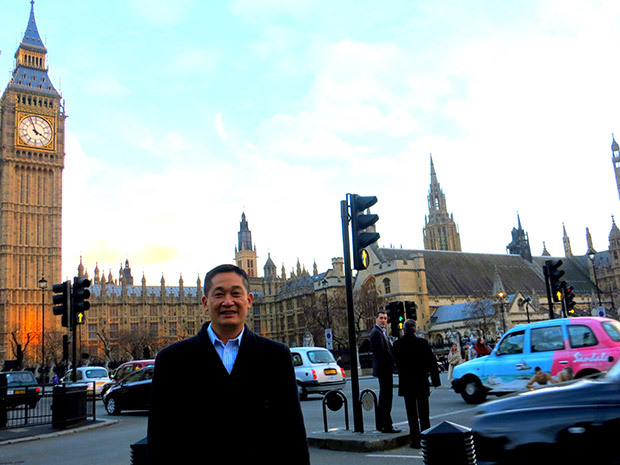 Standing in front of the majestic Palace of Westminster built on the bank of River Thames in the City of Westminster, central London, the gloomy winter afternoon did not in the least dampen my spirit of merriment – personal, but a realization. Having long resolved that Sarawak is the best country in the world, I was not really perturbed with the fact that my passport was revoked for a long 18 years, with a brief interval of a week whereupon I took the opportunity to visit Rangoon, Burma (yes, in those historical days before the names were changed to Yangon, Myanmar) to support the people’s movement for democracy and was thrown out by the illegitimate military junta. Was proud of that, still am. But I must admit, in those years of travel restriction, there was a tinge of yearning to visit this one destination – the Palace of Westminster. The 900-year old iconic Palace of Westminster is not the residence of the sovereign Queen, but it accommodates the House of Commons and the House of Lords, the two houses of the Parliament of the United Kingdom. That speaks of the supremacy of the Parliament. More than a symbol of legislative supremacy in the UK, the Westminster model of Parliament and its institutions for parliamentary democracy is emulated throughout the world. Hence, John Bright, a British politician and reformer proudly expressed in 1865 that “England is the Mother of Parliaments”. Had John Bright lived 150 years later, today, he would have been even more flattered as it was not the formerly great empire compelling the colonies to adopt the Westminster Model of Parliamentary Democracy, but many subsequent new-born and liberated countries choosing to embrace it. And there wouldn’t have been mistaken and unnecessary confusion that the UK Parliament in Westminster is “the Mother of Parliaments “. Hence, it is not just about the history of almost a thousand years when the king first heard the lords and representatives of communities in this regal Palace of Westminster from the Anglo-Saxon period, but  evolution of parliamentary democracy, not least the change of tenants from the kings to the parliamentary legislators in this Palace! And, of course, it is about the hard works of the UK parliamentarians that have set the example for other parliamentary democracies, and caused the Palace of Westminster to emanate the glow that reaches all corners of the World. We cannot resist comparing our magnificent Sarawak State Assembly building with the Palace of Westminster. After all, we are prideful of our DUN building, on a hill and by a river, an envy of other parliamentary assemblies in the Commonwealth which are located either on a hill or by a river, and not both. Unfortunately, there is huge disparity in the works being carried out in our DUN (comparing with the UK parliamentarians) and the remuneration for members of the Sarawak State Assembly (vis-à-vis the UK parliamentarians). The UK public elects Members of Parliament (MPs) to represent their interests and concerns in the House of Commons. MPs are involved in considering and proposing new laws, and can use their position to ask government ministers questions about current issues. Some MPs from the governing party (or parties) become government ministers with specific responsibilities in certain areas, such as Health or Defence. When Parliament is sitting (meeting), MPs generally spend their time working in the House of Commons. This can include raising issues affecting their constituents, attending debates and voting on new laws. In their constituency, MPs often hold a ‘surgery’ in their office, where local people can come along to discuss any matters that concern them. Sounds quite similar to what elected MPs and State Assembly persons do in Malaysia and Sarawak? The biggest difference is in the sitting (meeting) time of our State Assembly and the UK Parliament. While we sit for 16 days (split into 2 sessions of 8 days each, in May and November) in a year, the UK Parliament sits the whole year round, save for periods of “recesses”. Hey, the UK parliamentarians are paid a basic annual salary of £67,060, plus expenses to cover the costs of running an office, employing staff, having somewhere to live in London and in their constituency, and travelling between Parliament and their constituency. In Sarawak, our members of the State Assembly are paid an annual basic allowance of RM180,000, plus other fixed allowances to cover their expenses with a little variable and claimable expenses, though not the costs of running an office and employing staffs that weigh heavily on the ADUNs. £67,060 (converted to RM300,000) may sound a lot, but my quick survey shows that a serving of “fish and chips” in a London café and restaurant costs between £8 and £14, and a meal of “Kampung fried rice” in our café and restaurant in Kuching costs RM6 to RM12. It is merely a case of earning in Ringgit paying in Ringgit, and pound sterling for pound sterling. Indeed, we are paid the allowance comparable to the parliamentarians in UK, but we certainly do not sit (meet) or assume as much responsibilities as our UK counterparts. As a start, maybe we should have six sittings maintaining the eight working days per sitting? Or four sittings of 12 working days per sitting? The present flooding which is experienced throughout the state have exposed infrastructural and administrative shortcomings and may require policy adjustments, but as it is, the next sitting is in May and the weather will be dry and hot. How many ADUNs would raise the questions on flood mitigation measures, or flood relief operations? In the November 2013 sittings, I had tabled a private members motion and raised in my budget speech calling on the State Assembly to examine the roles of our ADUNs hoping that our noble Sarawak Legislative Assembly can advance and progress and thereby perform a more dynamic and functional role in the governing of our beloved State and, at the same time, preserve and uphold our proud record as the preeminent state assembly in Malaysia. I have drawn the attention of the State Assembly to the forms on parliamentary reforms with parliamentary committees and select committees in the Parliaments of India and UK, the lessons we can learn to make our legislative assembly a source of constructive and effectual recommendations on how the governance and government can be improved. In the UK Parliament, there are Departmental and Parliamentary Select Committees which are committees made up of parliamentary members appointed to deal with departments, particular areas or issues. They investigate, collecting data or evidence for a law or problem, and try to resolve the issues or matters immediately. Further, there are the Commons Select Committees which examine the spending, policies and administration for each government department. We are actually in an opportune time to effect parliamentary reforms in our Sarawak State Assembly. Our Speaker Datuk Amar Mohamad Asfia Awang Nassar was a seasoned parliamentarian and a long serving Speaker who has been actively participating in meetings, exchanges and conferences engaging in the furtherance of parliamentary democracy, through such international forums as the Commonwealth Parliamentary Association, Conference of Commonwealth Presiding Officers and Speakers and the Westminster Seminar on Parliamentary Practice and Procedure. He was once elected as an Executive Committee Member of the Commonwealth Parliamentary Association, representing the South East Asia Region. His vast experience and knowledge in parliamentary reform agenda are certainly valuable and able to guide this Honourable House to be upgraded, reconstructed and rejuvenated, towards its excellence and be emulated by the other state assemblies in Malaysia. Not only have we raised the allowance of our ADUNs to be the highest paid legislators in the country, we have also amended the State Constitution to increase the number of ADUNs in the state from 71 to 82. It makes simple business sense: the pays are raised, more are employed to do the works, the ADUNs must assume more tasks and responsibilities and deliver better services. We have a magnificent State Assembly building that is no less than a palace. What is lacking is the reform to institute legislative supremacy. The ball is at the feet of the Yang Berhormats.